Denver, Colorado – BRP (TSX:DOO) continues to conquer the heart of off-road enthusiasts in North America and expands the Can-Am off-road brand’s footprint in the side-by-side industry by introducing an all-new Can-Am Maverick Sport MAX DPS 1000R and new innovative specialty packages. The Can-Am Maverick Sport MAX DPS 1000R delivers riding excitement for up to four riders in a daring, precise and confident package. The versatile performance side-by-side vehicle is especially attuned for trails. A performance-grade suspension system with FOX 2.0 PODIUM QS3 shocks, power steering, and 60-in (152.4 cm) width improve the overall riding experience. A rear-mounted Rotax V-Twin engine supplies optimal performance and reduces cockpit noise. The designs and functions allow more comfort and roominess for four riders. Plus, to enrich the interior comfort, four ErgoPrint seats, additional foot rests and passenger grab bars complement the driver’s standard amenities. Can-Am also unveiled three specialty vehicles driven by the enthusiasts. The new Maverick Sport X rc side-by-side vehicle ($21,299 US) comes factory-equipped for rock-crawling with a wider stance, higher clearance and added interior and exterior protection for operation in harsh environments. The inclusion of Smart-Lok* with ROCK mode, high-grade FOX shocks, arched A-arms and larger tires provide exceptional maneuverability when the going gets rough. The new Maverick Sport X mr ($20,999 US) and Defender MAX X mr ($20,799 US) side-by-side vehicles each target the mud-riding devotees with purpose-built refinements, including snorkeled air and engine intakes, but do so in different packages. 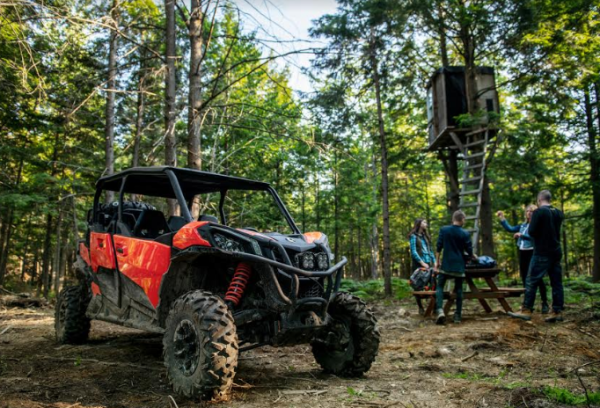 The Maverick Sport X mr can accommodate two riders, while the Defender MAX X mr package can carry up to six adults with its dual rows of bench seating. Both side-by-side vehicles include Smart-Lok with MUD mode, higher travel, arched A-arms, a stable 64-in (162.6 cm) width, extended ground clearance and aggressive ITP mud tires for superior traction. The Maverick Sport X mr has a new gauge, FOX shocks and premium half doors for a more functional performance. The new Can-Am Outlander 6x6 450 ATV, complete with true six-wheel traction and capability, has steel racks and other strategic changes to expand the 6x6 segment to new customers. In September of 2015 BRP President and CEO José Boisjoli pledged to unveil a new side-byside vehicle every sixth months through the year 2020. The Maverick Sport MAX DPS 1000R is the seventh vehicle introduced since that time. Ski-Doo, Lynx, Sea-Doo, Evinrude, Rotax, Can-Am, Alumacraft, Manitou, Maverick Sport, Outlander, and the BRP logo are trademarks of Bombardier Recreational Products Inc. or its affiliates. All other trademarks are the property of their respective owners.